District 3 is also where the Millenia project plans to have a 210-acre community that will include 3,000 multi-family residences, 2 million square feet of office space and 1.5 million square feet of mixed-used projects. Within the Millenia area, the population is projected to increase by 8,500. Construction is already underway. Another development included in District 3 is a Baldwin & Sons project that will feature the first hotel in eastern Chula Vista as well as 15,000-30,000 square feet of mixed retail and 600 residential units. That’s in addition to the Otay Ranch Town Center’s plan to add 300,000 square feet of retail space. 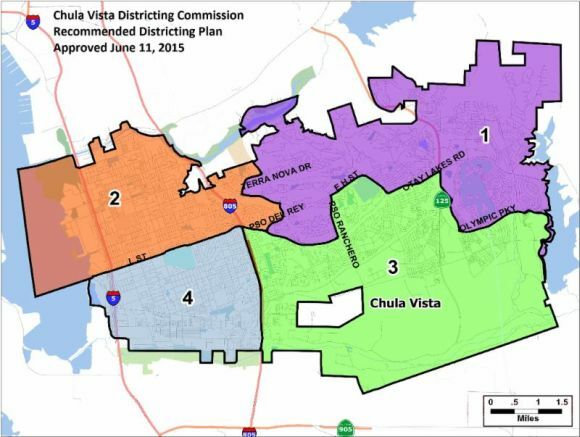 Finally, Chula Vista wants to attract a four-year university on 375-acres of land in District 3. The city hopes the new University will serve 20,000 students. In an interview after the City Council’s vote, Districting Commissioner and Chairman Jerome Torres explained that redistricting is going to happen again after the next decennial census, so in 2021 a new commission will be created. For the West side, Torres was referring to district 2 where the Unified Port of San Diego plans to open a 750-room hotel as well as 120,000 square feet of commercial recreation at the Bayfront. Pacifica Companies also plans to build 1,500 residential units, 420,000 square feet of mixed-used commercial space, and another 250-room hotel on 35-acres. While Asian-American residents from district 3 were civically engaged throughout the process, residents from District 2 did not provide public testimony during the June 8th finalization of the map or before the City Council’s vote. Residents from district 1, which now includes Eastlake and the upscale area known as The Woods, remained a quiet, non-unified group throughout the process.